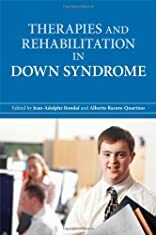 Therapies and Rehabilitation in Down Syndrome covers the entire lifespan of a DS patient, from infancy to 60 years and beyond, focusing not simply on identifying problems, but providing a detailed look at major therapeutic approaches. Discussion includes future genetic therapy, questions of quality of life, hormone and other therapies for medical problems, prevention and treatment of normal and pathological aging, as well as psychomotoric rehabilitation. This is an important book not only for scientists concerned with various facets of DS, but practitioners looking for guidelines for therapies and clinical application of research findings. About Alberto Rasore-Quartino (Editor) : Alberto Rasore-Quartino is a published editor. Published credits of Alberto Rasore-Quartino include Therapies and Rehabilitation in Down Syndrome.